Moldova shares its heritage with Romania. Moldova was a part of Romania until after WWII. Moldova gained independence from the Soviet Union in 1991. The Moldavian flag is based on the Romanian national flag to represent a shared heritage. The three colors of the flag, blue, yellow and red, were the three colors used on the flag after the French revolution. 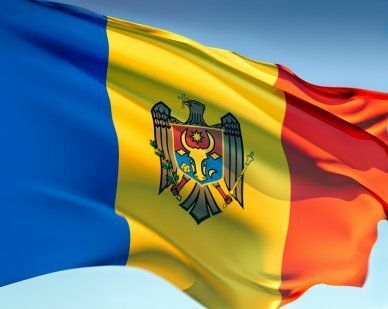 The only difference between the Moldova flag and the Romania flag is the coat of arms emblem used on the Moldova flag. The coat of arms has an eagle holding an Orthodox Christian cross in its beak while holding an olive branch in its talon. Our top-quality Moldova flags conform to all official specifications. Emblems and designs are executed with the highest possible degree of accuracy in regard to detail, color shades, placement and proportion to flag size.